Wits students represented South Africa (SA) at the Youth Touch World Cup in Malaysia on August 8-11. 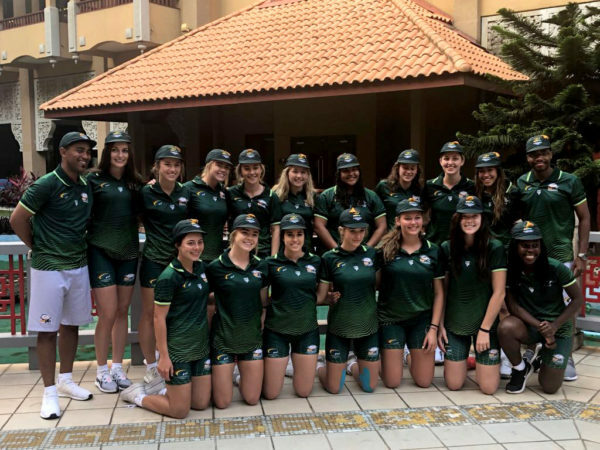 Ameerah Emeran and Raquel Scott were part of the six SA teams that travelled to Putrajaya to participate in the nine-nation competition. Scott, a first-year BCom student and women’s under-20 player, said that the experience has shaped her as a player and renewed her passion for her goal of playing for the SA open team by 2023. “When it comes to playing a team sport, specifically touch rugby, initiation was a major factor that impacted my game as I learnt that taking the initiative and responsibility on the field was very beneficial when it came to the flow and movement of the game.”Scott’s team played Singapore in the third and fourth place playoff and won 9-5. Emeran, a first-year BA student and SA mixed-20 player, faced Hong Kong in her team’s third and fourth playoff which they won 9-7. Her side had lost the final round robin game against Hong Kong, 6-5 and were adamant to right this wrong in the bronze medal playoff. Assistant coach of the mixed-20 team, Daniel Ackerman, spoke to Wits Vuvuzela about what he and his team had hoped to achieve in Malaysia. “We wanted to come here and play an attractive brand of touch that everyone would enjoy. We also wanted to score more tries against New Zealand and Australia than any other opposition,” he added. Ackerman added, “We worked hard for our bronze medal, even the referees commented on the energy and agility that the SA teams play with. We achieved our goals and left an impression on the other teams. “There are basics and factors that we could improve on such as physical conditioning, maintaining a high tempo and conditioning which will improve our level of touch,” said Ackerman. The nine participating teams included South Africa, Australia, New Zealand, Hong Kong, Singapore, China, India and Malaysia. South Africa achieved bronze in all categories. Australia, the highest ranked side at the tournament, took gold in all categories while New Zealand achieved silver in all categories. The international Touch Rugby World Cup will also be played in Malaysia in April, 2019.